With the advent of the internet, people are looking at the online world for a perfect place for socializing. The likes of Facebook, Twitter, Instagram, and LinkedIn have managed to attract billions of users to their platform. So if you are thinking of creating a Social Networking website, then that isn’t too bad an idea. Even if your platform doesn’t manage to reel in billions or millions of users, you should still manage to gather a decent user base of regular visitors which can ultimately lead to the site’s success. However, to do so, you need an alluring enough website. OneSocial Theme offers an excellent option for users looking to create a community website. Design-wise, it boasts a minimal appeal which makes it load faster and also helps users find their way around the site. In terms of features, the theme can help users to set up a personal profile online, or to share information with the public and even create public/private groups amongst friends. And for the webmaster, the theme developers an option-filled admin panel which delivers total control on what can be achieved through the theme. Social login integration which makes it easy for users to login to your community website by using their Facebook or other social media accounts. Multilingual support which helps you to cater your services to different users across the globe. Provides users with a special option to start their own blog on your platform. The website is also WooCommerce ready making it possible for you to start selling products online. The theme is also high SEO friendly making sure it pops on search engines. 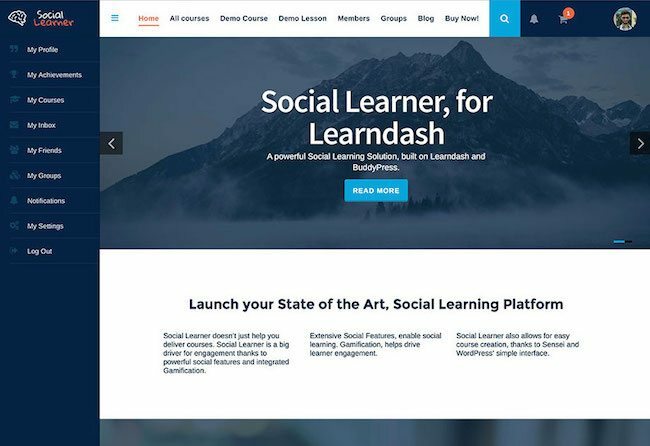 Social Learner Theme has been made with the intention of using it with Learndash and BuddyPress. If you don’t know already, Learndash is a plugin which helps integrate a learning management system into WordPress, whereas BuddyPress is a community building plugin for the CMS. This is one of the ideal choices for people looking forward to creating an online community revolving around education and learning. You can use the theme to create membership plans for users or even sell courses through your website. Easy integration of options such as drip feed content, advanced quizzes, lesson timer, etc. Ability to create a deep immerse experience with separate course access page, forums, membership profiles, and so on. Customization options to help you brand the content on your website. Multilingual support and RTL options to help cater to audiences from around the world. Now coming to the aid of users who are essentially new to this whole community website building. 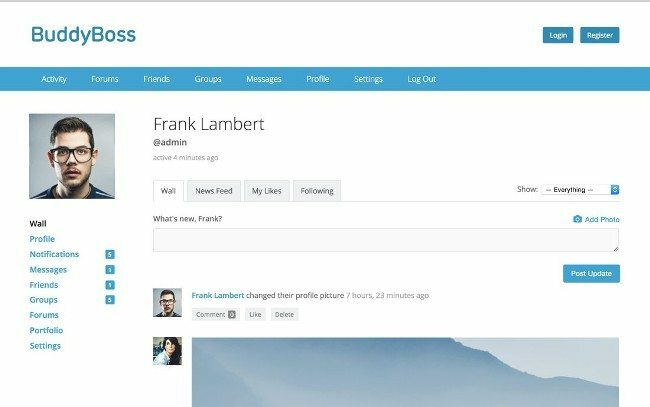 If you are a new user of BuddyPress, you will very much appreciate the ease of use, and minimalistic offers of BuddyBoss Theme. The theme comes with a demo install button, which will have your site ready with a click of a button. Despite its beginner-friendly appeal, BuddyBoss also comes with the option to allow developers to tweak around with its codes. Hence if you are good with your PHP and HTML skills, you can basically bring about decent customization changes to the theme. The theme supports all BuddyPress plugins, so you will never run into compatibility issues. The theme is super user-friendly, and you can easily get a grasp on how to use all aspects of the theme. But in case you need help, it offers in-depth documentation and great quality support. The theme is updated on a regular basis for the last six years. 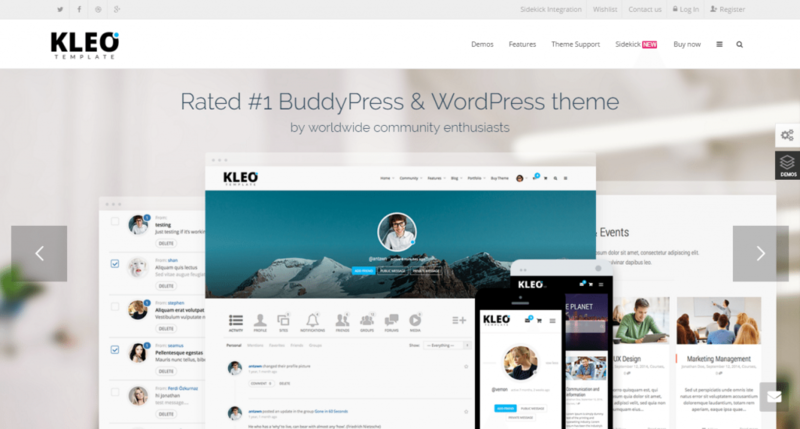 KLEO Theme is one of the popular community WordPress themes and is currently in its fourth iteration. To help you get started from the get-go, the theme comes loaded with demo content which can be easily incorporated into your site with a click of a button. The diverse collection of 20 demos, which is still rising, should cater to most of your needs from a social networking based website. There are also many features offered within the theme which can be a bit overwhelming. But luckily, KLEO comes with sidekick tutorials built in, so you will get the hang of using all the features of the theme, relatively quickly. Ready-made login and registration pages for your users. Comes with a boatload of useful plugins which together helps you save around $33. Visual Composer built in which helps you create a custom page layout. Sensei plugin also provided to help set up e-learning courses. 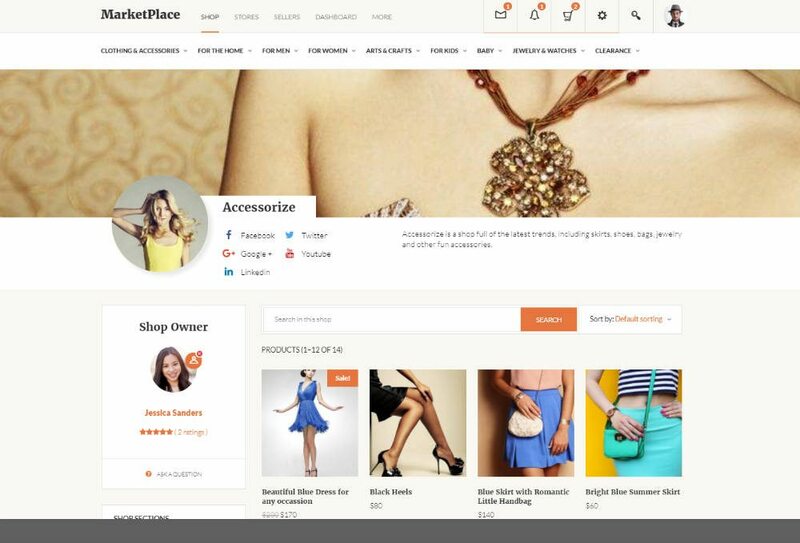 If you intend to create a community centering around a marketplace, similar to eBay, then Social MarketPlace Theme might be of some assistance. The theme is a blend between WooCommerce and WC vendor to help design a compelling marketplace experience. You can facilitate members by helping them create an online store and helping them customize and personalize the store as they see fit. You can also integrate Affiliate commissions within the community experience, which will be a greater incentive for users to join. The theme comes with a powerful feedback system which is necessary for any marketplace. There is a very handy product and attribute filtering system. You also get access to Visual Composer to help you tweak around with your sites aesthetic appeal. So this was our Best WordPress Social Networking Themes roundup. Hope you found this to be helpful. Do let us know if you decide to use one of the themes we have mentioned here in this post. Also, if you are already a user of any one of these themes, then leave a comment below regarding your experience. Other users will love to receive insight from a fellow reader.